Why was this set up? - To provide support to the wider range of causes supported our wider INTO family. Why Does the money need to go through INTO Giving? - Because we are a charity - we have to show a total coming into our account and then that total plus 20% leaving it. This is just for our own financial tracking and auditing. Who can this help? - We've made our remit as wide as possible to ensure we capture as many non-profits as we can! You can find out more about the areas we support below. 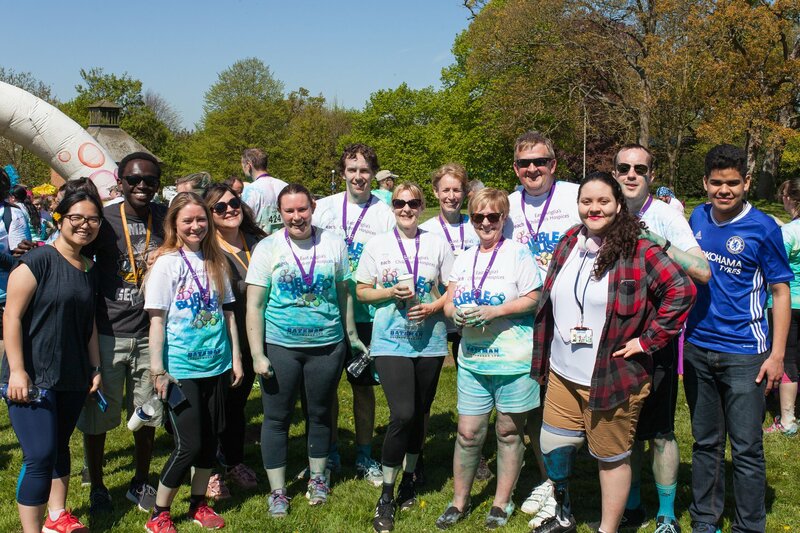 But so far you've raised nearly £8,000 which we've topped up by 20% for causes such as Breast Cancer Awareness, Children in Need, Cancer Research UK, The STROKE Association and East Anglia's Children's Hospice. iGive! Fundraising with a top up! 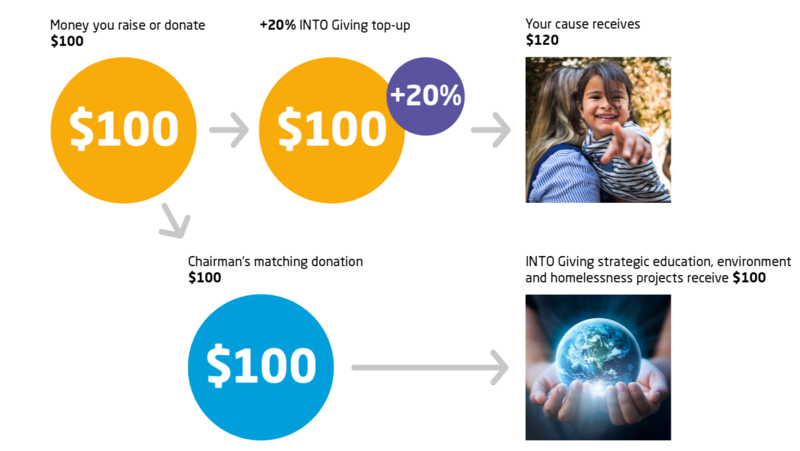 We'll top up your fundraising by 20% AND we'll match the total for INTO Giving projects too! Because it comes with bonuses. Very big and tangible bonuses. We're talking about matched funding that MORE THAN DOUBLES your fundraising. In other words, what you raise for a charity close to your own heart adds up to a whole lot more. Our wider remit includes all of the following areas: To get more information on each area, click on the picture below. So you've decided to use the iGive campaign to increase your fundraising - that's great news! Before you set anything up, it's important to work out and to let us know how you will be transferring us the money, this is so we can track it, know your total and then pass it onto your chosen charity with the extra 20% included. Our iGive logo should be used in your fundraising promotions and during your event. This is to help us raise awareness of the campaign and of INTO Giving projects too, you can download this logo here or the team at INTO Giving will email it directly to you on your initial contact about your fundraiser. The next step is working out how you would like to channel your donations. We have several options for this, either by using a Just Giving page, by donating online using the iGive portal or by completing a direct bank transfer. 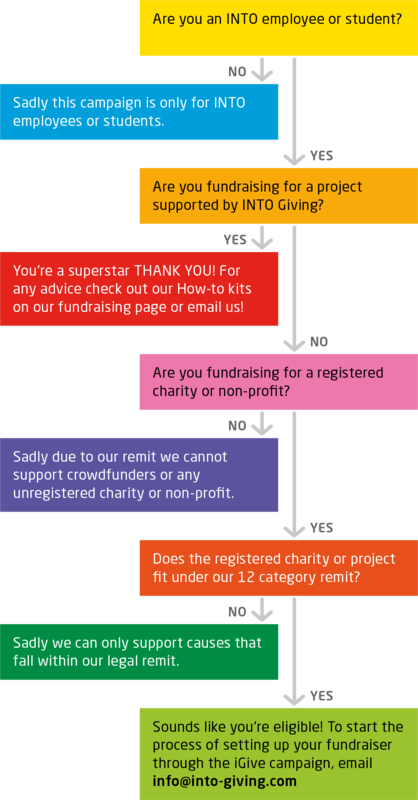 If setting up a Just Giving page the main charity needs to be set as INTO Giving, we have an easy to use template that explains the iGive process and leaves space for you to add information about your chosen charity. You can download this template here. 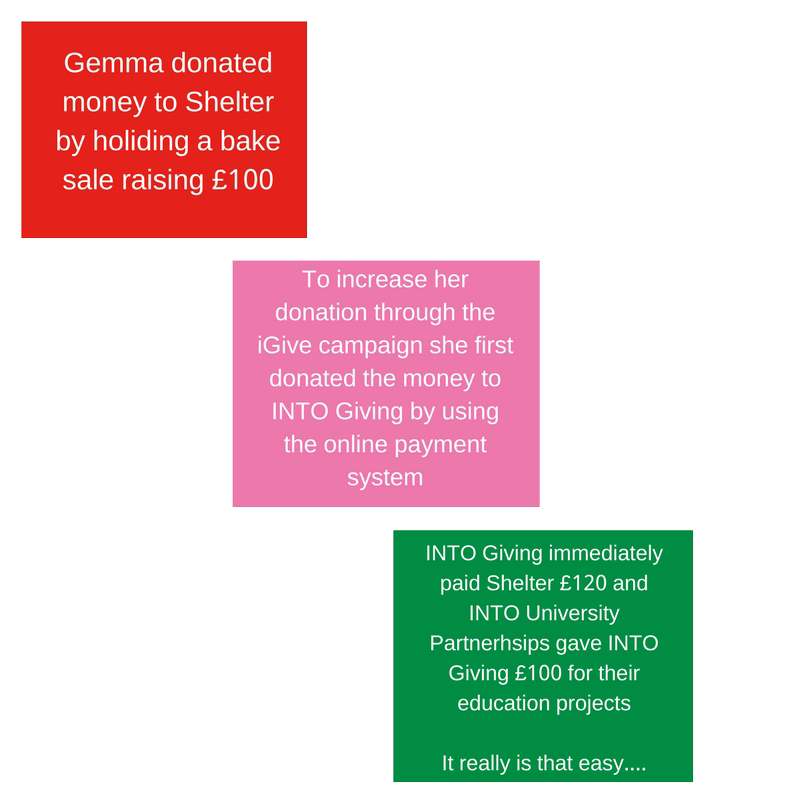 Or feel free to create your own content and explanation, INTO UEA staff set up an iGive fundraiser if you'd like to see a good example of how this should look. If you would like to send us a direct bank transfer please email info@into-giving.com for more information. Please be aware that when using this option Gift Aid would not be added. US 501(C)(3) Tax exempt charity.